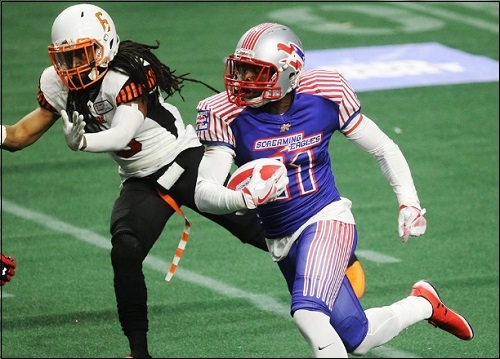 Salt Lake Screaming Eagles defensive back James Calhoun has been named the Indoor Football League's Defensive Player of the Week for week 15, the IFL announced today. Calhoun was spectacular in the Screaming Eagles' 64-27 win over the Cedar Rapids Titans on May 29. Calhoun intercepted three passes, returning all three for touchdowns, to lead a Salt Lake defensive effort which held the Titans scoreless throughout the second half. The Screaming Eagles scored four defensive touchdowns. Calhoun also had 2.5 total tackles and four pass breakups. Calhoun's teammate, Rashad Greene, who also had a pick-six in the second half, earned Honorable Mention honors for Defensive Player of the Year. This is the second such honor which Calhoun has earned this season. He was the Defensive Player of the Week for his three-interception, eight-tackle and two pass breakup-performance in week 11 in Salt Lake's 31-29 loss to the Spokane Empire. He returned one of those interceptions for a score in the third quarter of that game. For the season, Calhoun has appeared in seven games. He is leading the IFL with seven interceptions, 205 interception return yards, and five of those interceptions returned for touchdowns. He is averaging 22.0 yards per kickoff return, along with one touchdown. He filled in at wide receiver for a game, catching six passes for 51 yards. It is the fourth Player of the Week award for the Screaming Eagles. In addition to Calhoun's multiple honors, kick returner/wide receiver Chris Robinson was named Special Teams Player of the Week in week 14, and quarterback Verlon Reed was named Offensive Player of the Week for week 2 after the Screaming Eagles' recorded their first ever win. Calhoun recently took some time to answer some questions from SCtoC. The Offensive Player of the Week and the Special Teams Player of the Week for 15 were wide receiver Brady Roland of the Iowa Barnstormers and kicker Rockne Belmonte of the Wichita Falls Nighthawks, respectively. The Honorable Mention list for Offensive Player of the Week consisted of: WR Kyle Kaiser (Colorado Crush), WR Damond Powell (Cedar Rapids Titans), QB Travis Partridge (Iowa Barnstormers) and WR Antonio Vaughn (Arizona Rattlers). The Honorable Mention list for Defensive Player of the Week consisted of: DL Ra'Shawde Myers (Iowa Barnstormers), LB Javicz Jones (Iowa Barnstormers), LB Azziz Higgins (Colorado Crush) and DB Rashad Greene (Salt Lake Screaming Eagles. The Honorable Mention list for Special Teams Player of the Week consisted of: K Mikes Bergner (Colorado Crush), KR Antoine Johnson (Cedar Rapids Titans), KR Demetruce McNeal (Nebraska Danger), and KR Jamal Miles (Arizona Rattlers). The Screaming Eagles, who are 4-9 on the season, host the Iowa Barnstormers on June 3 at 6 p.m. (pacific time). SCtoC will feature a preview and game thread for that game. No surprise here, but this is a great honor for him. He had such an amazing game. He definitely deserves this!